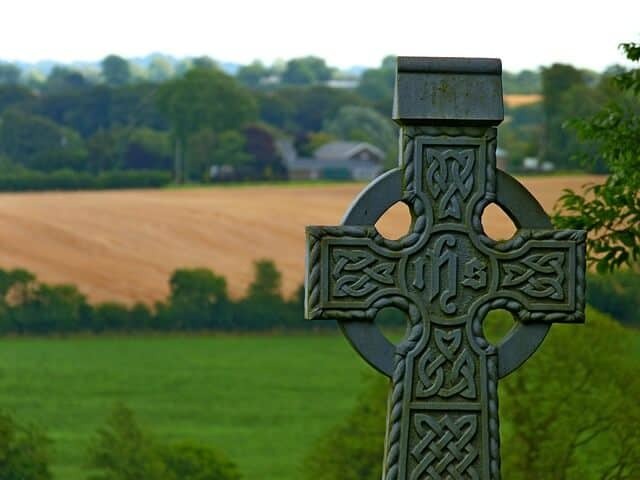 The Celtic cross has a fascinating and complex story behind it. In recent years the cross has been popularised in many Irish symbolic tattoos. It appeared back in Ireland and Britain in the early middle ages. The true origins of the Celtic cross are unknown, but there is plenty of theories and legends. What is the meaning behind the Celtic cross? A Celtic cross in an Irish field. As I mentioned above the cross has many theories. One to popular theory is that the cross was introduced by St Patrick when he was converting the pagans in Ireland to Christianity. It is a Celtic symbol of both culture and faith. The cross has a few variations, but typically you will always be able to make out the symbol of a cross. By exact definition, an Irish Cross or Celtic Cross has to have four semi-circles cut away at the four points where the horizontal and vertical beams meet. It is also a common trait that the lower vertical section is wider at the base than at the point where it meets the centre, while the other sections are rectangular. Neither of these is strictly are strictly adhered to in modern symbols. If you are looking for some Celtic cross jewellery make sure that you know the difference between a Celtic cross and a sun cross. The sun cross is a symbol remarkably similar to the Celtic Cross. The sun cross actually predates the Celtic cross, and there are some theories that it might be a predecessor of the shape. The sun cross is a circle divided into four equal quadrants by a horizontal and a vertical line. Neither of the two lines extends beyond the circumference of the circle. The four quadrants may be taken to represent the four seasons of the year or the four stages of the day – morning, midday, evening and midnight. Whereas a Celtic cross is typically wider at the base than where it meets the point. Basically, the Celtic cross looks more like an actual cross than a sun cross(ironically). Check out some quality incredible Celtic crosses on Amazon here. Antique spirituality meets modern fashion with the widespread induction of Celtic Cross tattoos. The Celtic Cross shares its popularity with the Celtic tree of life which seems to feature in modern jewellery more and more every day. The cross is rich in powerful representation and an ideal reflection of the hopes and ambitions of the Celts. While the Cross is certainly a Christian symbol, it has its roots in ancient pagan beliefs at the same time. It is a remarkable fact how widespread the distinct shape of the Irish Cross is in the modern era. Original they were not carved out of the rock – they were inscribed on the rock. In the mid-19th century, a Celtic revival led to an increased use of the ringed cross in Ireland, and the Celtic Cross became not only a religious symbol but an emblem of Celtic identity. If you wish to know more about other incredible Irish symbols read my post here. Join my weekly dose of Irish email list here. where I send my weekly summary of all things Irish.